What do Alabama debutantes and local fishermen have in common? Not much. Unless you’re at Boathouse Oyster Bar. It’s a place where all walks of life who love oysters can come and indulge in some aphrodisiacs, cold beer, and good company. “This is a family business,” Green explained. “I moved here from Tampa in March of 1987 to start working for my mother. She fired me, then hired me back, on three separate occasions.” She seems to live by the concept “the customer always comes first.” Her clientele ranges from homeless folks living under the bridge to affluent millionaires. Even celebrities have visited this place. But the real heart-and-soul of Boathouse belongs to the local fishermen. Y’all may have been to Boathouse before, and if you have, take one hand to pat yourself on the back, then take your other hand and rub your belly remembering of all the oyster goodness you consumed courtesy of owner and proprietor Kelly Green. Her kitchen brings in Appalachicola oysters fresh from the Gulf and either shucks ’em to serve up raw or covers them in cheese, bacon, jalapenos, or whatever else is tasty. There’s also fried shrimp, steam crab, and chicken fingers on the menu for the kiddies. 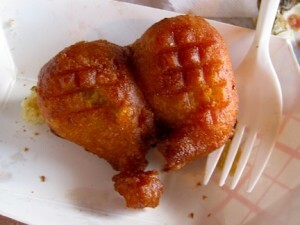 Homemade hush puppies are also on the menu. Ours just happened to come shaped this way. Boathouse on the docks of Destin, Fla., has maintained the same business model since 1986. Her mama Wanda “Mamma Gumbo” Green, and her partner Paul “Action” Jackson purchased the marina where Boathouse sits almost 25 years ago. Their big anniversary was this past October. 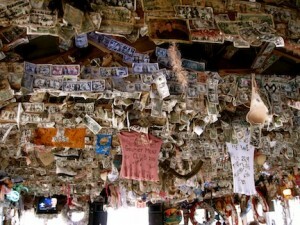 Dollar bills, bras, and other keepsakes adorn the rafters of The Boathouse. For more information check out The Boathouse’s web site or just stop by next time y’all are in Destin. Boathouse Oyster Bar is a landmark on the Emerald Coast of Florida, Destin to be specific, and people stop in from all over the country. I’ve met hundreds of people from all walks of life who enjoy this fantastic locals/tourist hangout featuring fantastic views of Destin Harbor and mouthwatering food. If you happen to make it down to the Panhandle, Boathouse is a must-do for your to-do list. Make sure to get a dozen (or more) of the fresh oysters. Live music is always wonderful.